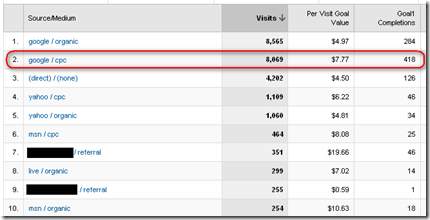 But did you know that you can measure goals for all your traffic sources in Google Analytics? It is great to be able to see how effective your Pay Per Click spend is, but below I help describe how to measure conversions using the Google Analytics tool. 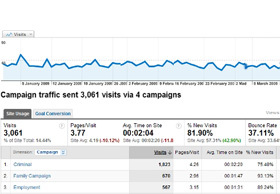 Most of the time, tracking a conversion or goal through Google Analytics is relatively straightforward. For example, when a thank you page is accessed after a lead is submitted or a checkout is completed, add these goals to your Google Analytics profile and suddenly you have the ability to see how effective your traffic sources and keywords are being at creating conversions. In fact, by applying these goals you can look at how a huge number of metrics affect goal conversion. The graphic to the right provides a snapshot of which traffic sources have resulted in goal completion. As you can see, placing a value for the goal allows a per visit value to be calculated, valuable information for deciding where to allocate your campaign budgets. 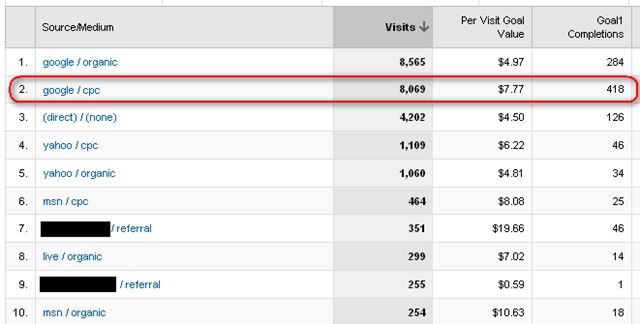 Sometimes in Google Analytics, we need to track a goal that doesn’t have a page to record a visit to. This can be a mail form that doesn’t link to a thank you page, or perhaps a link to an external link to an online reservation system. How do we track this? 1) Identify the goal/link to track. Example below is for an online booking system for a hotel chain. 3) Add the virtual page as a goal in the account profile, and hey presto… you’re tracking conversions that you previously weren’t! The image to the right shows 5 email inquiries that were initially considered to be the only conversions on this site. Now, because we have setup a new goal, we can also see 144 online reservations that were not being tracked before. This provides a much more accurate picture of how effective this website is being. The aim of all this goal measurement is to understand the true value of your website and the internet marketing campaigns that you are running. It is understanding how many customers your site really brings to you which then allows you to see how effective your online ad spend is for you. Measuring goals as effectively as possible unlocks this information and allows you to make “data driven decisions”. There is nothing better then taking opinion out of your decision making and going with ones that are driven by data. This is one useful technique for tracking a goal. This way Google will help us to track a goal even if that doesn't have a page to record a visit. Thanks for this valuable post. Very useful article. I am just getting started with setting up an AdWords campaign and will certainly use this information (especially the goal tracking!) to analyze results and increase conversions. Thank you! Thanks for a great article Jon! I have just recently begun using Analytics “properly” and find that your article explains conversion tracking in a very clear way. You are absolutely right about setting up goals. I have been using Alaytics for a few weeks but without measuring the effectiveness of my campaigns. The tool is much more useful when understood in the proper context. 🙂 Thanks again! Really the visit was rewarding. Articles like this kind snap us out of a ‘don’t know what to do situations’. Setting up the analytics tool and codes befitting to our goal measurements counts a lot in your strategy processing. 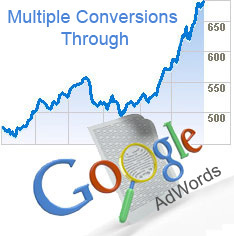 Impeccable tracking system is the lifeblood of your SEO and PPC campaigns. A great piece of information Jon. I often found sites embedding a js code along with the Google Analytics code, now I know what the code meant and its importance on data tracking. Building a sales funnel incorporated website will have a good impact only if the results were measured accurately. Nice writeup Jon. I guess the major point about measuring conversions in Google Analytics vs Google Adwords is that through Analytics its not PPC specific. Plus you can get an amazing depth of knowledge that way further reaching such as where your conversions are coming from, which regions, times, and which pages. Alot of good info in there. Its just important to make sure its setup properly! Jon thanks for sharing it here. This is a new piece of information to me. Sometimes virtual pages embed the most important conversion goal and may not be tracked. This results in wrong analytics data and that can create a serious dent in your entire marketing campaign strategy. For managing campaigns perfectly every time accurate goal measuring system is essential. 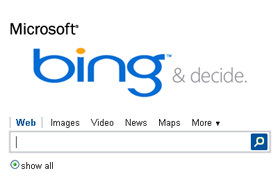 Internet Marketing	Microsoft Launches Bing Search!